Business owners from across the East Midlands have labelled NBV’s Business Growth Master Class a resounding success. The non-for-profit organisation NBV Enterprise Solutions ran their Preparing Your Business for Growth event at their Basford offices in November, and it proved to be a big hit with attendees. This master class is one in a series of events NBV run to support businesses across the East Midlands. It was held over two days and fully funded via European Regional Development Fund for all attendants. 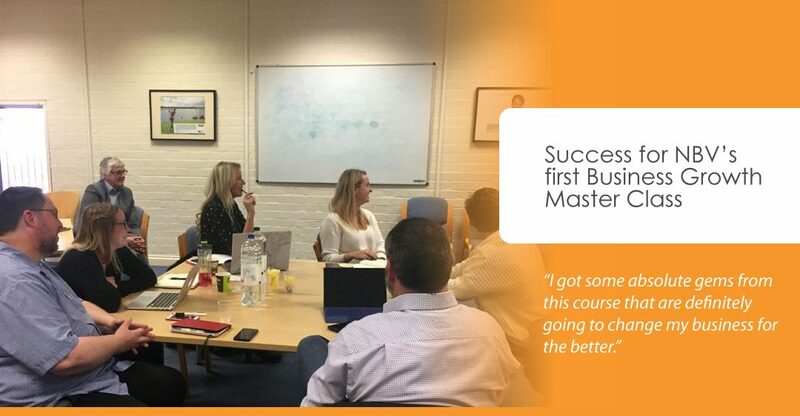 The master class was aimed at established businesses with an appetite for growth with key areas of focus being – creating growth, being a better business leader, building the right team and financial support mechanisms for growth. The event was delivered using a mixture of industry experts, guest speakers and the NBV business growth team. Guest speakers included Chris Barnes of the F Word, Alan White, Managing Director and Owner of the Fresh Group of companies, John Morley of i-Sourcer, a local multi-award-winning digital agency and Robert Pugh who is a cyber security expert within the East Midlands Special Operations Unit. To see a list of future Master Classes and to book your place, visit our Events Diary.